Crystal Audio Video Design offers a wide range of professional audio video accessories for uniquely customized commercial and business needs. Here is a glance of products we have and use in meeting your Home Theatre / HDTV audio video needs. "T" adapter, RCA jack to two RCA plugs, heavy gold plating with teflon insulator. "T" adapter RCA jack to two RCA jacks, heavy gold plating with teflon insulator. Right angle RCA plug to two RCA jacks, heavy gold plating with teflon insulator. S-Video male to RCA female adapter. Converts S-Video signals to composite video. bidirectional. Gold plated connectors and black chrome body. S-Video female connector to female RCA composite video "bi-directional" adapter. Female connectors on both sides. Splitting the LNB signal before connecting to multiple multi-switches. Connect your DVD, Set Top Box and more to your DVI-HDCP enabled High Definition Television, Projector or Plasma Display. HDCP Copy protected Inputs and outputs are not a problem! 4 HDTV Sources + 1 HDTV Screen = High Definition Versatility and Performance. 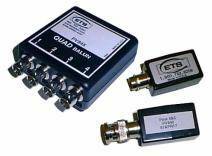 Digital Audio Baluns and Balun Panels from ETS are best-of-breed products, used by clients like Sony and ILM to transmit AES/EBU digital audio over coaxial cable, converting from and to the native XLR connector/wiring scheme. Individual baluns are available, as are rack-mountable panels incorporating up to 8 channels. Enables signal distribution from any HDTV or SDTV Component Video source to Component Video HDTV ready monitors. KD-DA6, can drive 6 monitors. Component Video and Left, Right; Digital PCM audio can be used instead of Left, Right. RCA connectors for all video and audio inputs and outputs. Supports component video 480P, 720P, 1080I, Analog L+R, Digital audio inputs to 9 Component video, Analog L+R, Digital audio outputs. Active circuitry with 8 buffered outputs and 1 passive cascadeable video, audio outputs. Cascade up to 10 units, the overall cable length using high quality component video cable should not exceed 150 ft. A front panel ground loop switch circuit minimizes input signals from buffered output signals, this helps eliminate 60hz rolling bars when there is more than one ground connection path between two pieces of equipment.